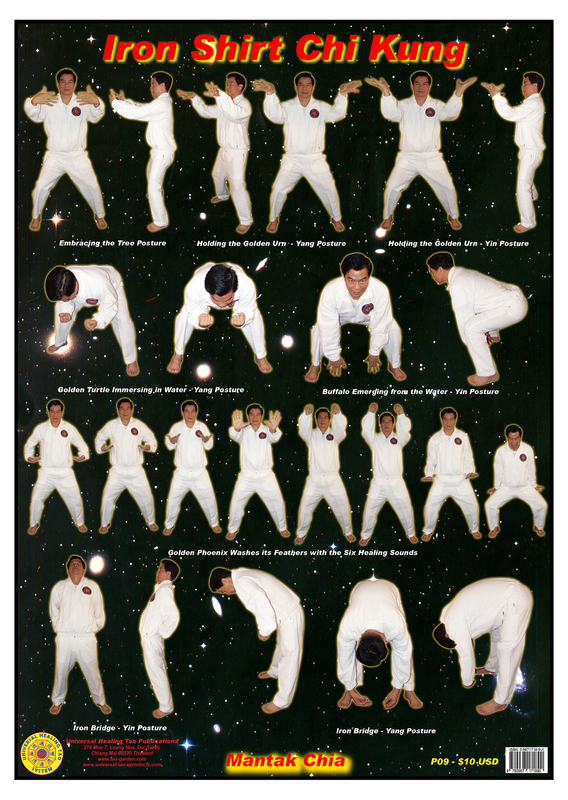 This poster illustrates all Five Standing Postures of Iron Shirt Chi Kung with Master Chia (Embracing the Tree, Holding the Golden Urn, Emerging the Turtle and Water Buffalo, Golden Phoenix Washing its Feathers, Iron Bridge with Yin & Yang Postures). With the correct structural body alignment you can root yourself into the earth creating an energetic grounding effect similar to a grounding wire in an electrical outlet socket. With this alignment any excess energy from the Inner Alchemy practices will ground itself automatically by daily practicing these Iron Shirt Seven Standing postures (Embracing the Tree, Holding the Golden Urn, Golden Turtle Immersing in Water, Buffalo Emerging from the Water, Golden Phoenix Washes Its Feathers, Iron Bridge and Iron Bar). When you align yourself to earth no one can push you around as is demonstrated through the Iron Shirt pushing techniques and root checking exercises. All you have to do is stand five minutes a day to achieve this over a long period of time.